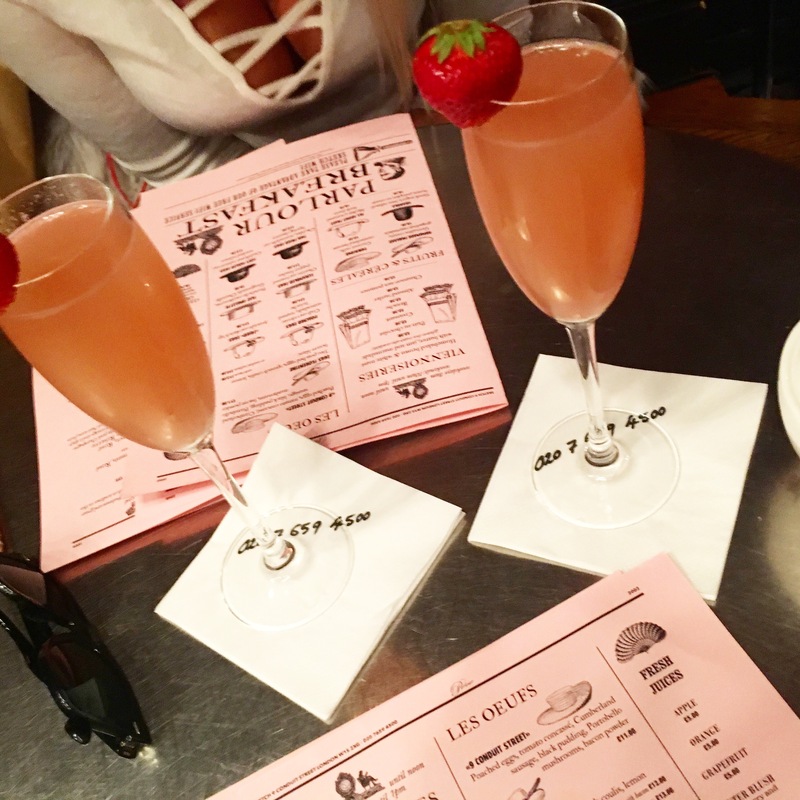 I’m having a love affair with London…did you hear? If you follow my instagram you’ll see my feed littered with delights I’ve sampled on my visits down south and you know what? It’s pretty darn marvellous. As I find myself consuming more and more of the delectable offerings our proud capital has to offer, attempting to squeeze them into one humble post seems to be even more of a struggle than reattempting to pull on my pixie pants after an indulgent weekend…. This is why I’ll be writing this post as part of a series, broken up to share the variety of my feast and help you find exactly what you want to eat whether you’re a local or simply there for a delicious visit. So, enough waffling (side note, stay tuned in this series and you’ll find out about this GREAT waffle place I discovered…) Let’s dive into the good stuff. If you’re into your pizza (and what sane person isn’t?!) Homeslice has to be at the top of your list. Notouriously busy, but for good reason; these guys sure know how to slice, so if you’re lucky enough to bag a spot to sit a while, make sure you take full advantage. You can buy by the slice, but for £20 you can go the whole hog, which I highly recommend you do. We went 50/50 on our toppings, opting for half a salami, rocket and Parmesan pie and half mushroom, ricotta, pumpkin seed and chilli. The size is impressive (bigger than your average car tyre), but the flavours are really something else. The dough is soft, rustic and can barely support its toppers – exactly how a pizza slice should be – simply fold it and eat it naples style. It will inevitably get all over your hands/sleeves/face, but you’ll be in too much ecstasy to care. The sauce, cheese and toppings provide the rich and satisfying flavours you’ve been dreaming of, treating you to authentic tastes of Italy with every bite. The mushroom half was a particular favourite of mine – order it and thank me later. If it’s too busy to grab a table and you aren’t prepared to wait, grab a slice to go and devour it under the bridge just outside. I don’t know who Ben is, but the guy sure knew how to made a cookie. Made with chunks not chips, these cookies are nothing if not pure indulgence and if you pass one of the many shops or pop-up window stores throughout London, STOP WHAT YOU’RE DOING AND BUY SEVERAL IMMEDIATELY. I say several because I am living proof that you simply cannot just have one (I once ate 5 just strolling around the Natural History Museum #noshame). A soft hunk of doughy, almost cake-y delight, you can get your cookies in a multitude of flavours. I highly recommend triple chocolate, praline and milk chocolate – but to be honest, there’s no way you can go wrong here, so fill your boots – oh and if you buy 3, you get a 4th free – you’re welcome. Quirky, kitsch and no portion control when it comes to halloumi. Muriel’s offers the perfect hideout with the comfiest ambiance should you fancy a break from the hustle and bustle of London streets. Plump cushions, fairy lights and more hanging greenery than your average botanical garden, I highly recommend you pop in for a lazy brunch and order…well anything! The menu boasts an array of beautiful breakfast eats to kick-start your morning including Muriel’s Popeye (I can’t quite explain its glorious-ness, but I insist you give it a try). Filled Croissants and a bodacious selection of fresh smoothies. I opted for the Grilled Halloumi, Roasted Tommies, Poached Eggs on Farmhouse Toast with a side order of Avo. Everything is cut with the same handsome wedge precision and frankly, I wouldn’t want to start my day any other way. Be sure to give it a go if you’re in the area. If you’re looking for that extra bit of luxury (and I know you are), be sure to head to Sketch , just off Regent Street. A bonafide ‘grammers paradise, this 18th Century Townhouse is home to one of the most fabulous afternoon tea’s in town. The Gallery is the hardest room to get into – but totally worth it. Pretty, pink chairs, marble chevron flooring and copper EVERYTHING create a decadent setting, complete with witty artwork and tasty tidbits to see you through your afternoon. The Parlour boasts the perfect balance between boudoir-esque decor and eccentric comfort. 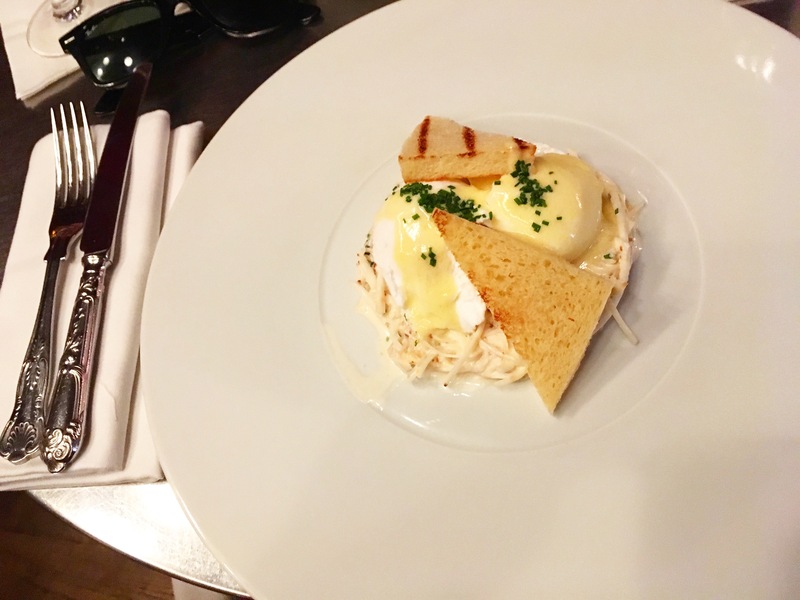 This combined with the lavish plates of rich and lip-licking flavours served by the pvc-pinny’s which circle the salon, make for a particuarly indulgent afternoon and one I highly recommend you try – and make sure you order the crab brioche. I’ll be honest with you, it’s a little on the spendy side, but if you’re in the mood for a treat or are looking to celebrate in style – it’s well worth the additional loan you’ll need if you decide to have more than 2 cocktails. 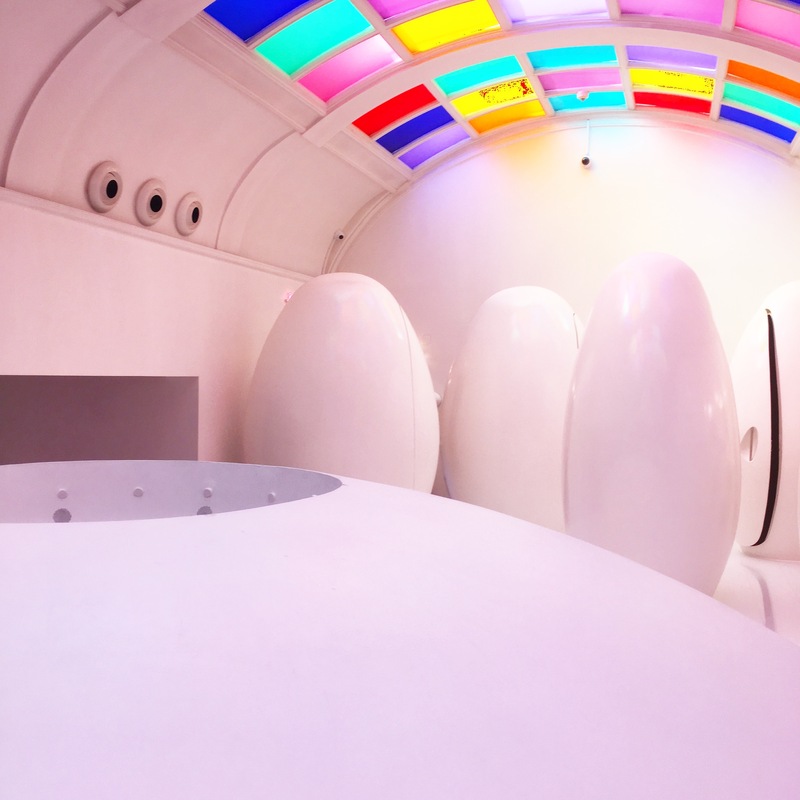 Oh and before you leave – you HAVE to check out the restrooms, it’s like a Ridley Scott dreamworld in there. The perfect pit-stop should you find your sugar levels running low whilst walking the length of shoppers central, pop into Selfridges and make a beeline for their food hall to recuperate any energy lost. Lola’s is just one of a handful of cute cupcake concessions, primped with rows upon rows of cupcakes, standing to attention and keen to please you. 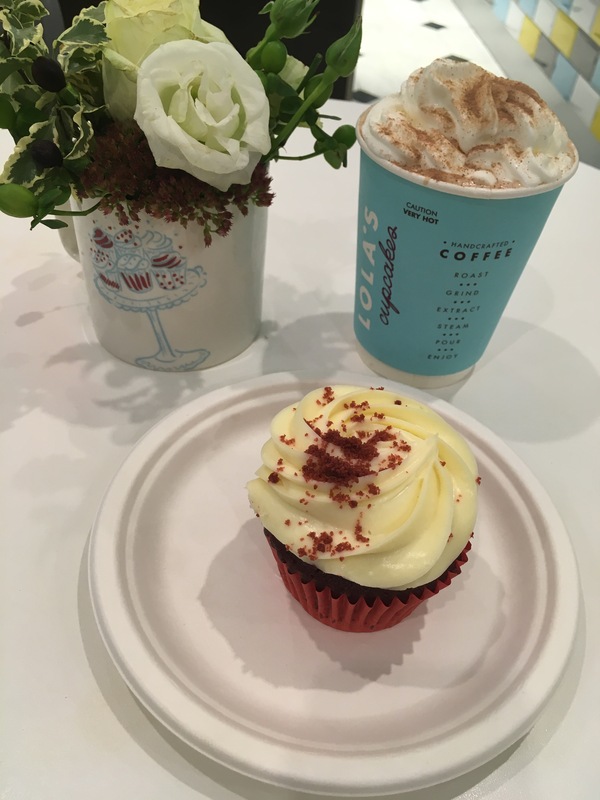 Never one to resist a Red Velvet, I munched my way through the thick, deep flavour of the sponge and marvelled at the silky smooth, “mmmm”-inducing dollop of whipped cream cheese frosting which crowned the top. A crowd-pleaser for sure, order with their Hot Chocolate with cream and mallows to really treat yourself. 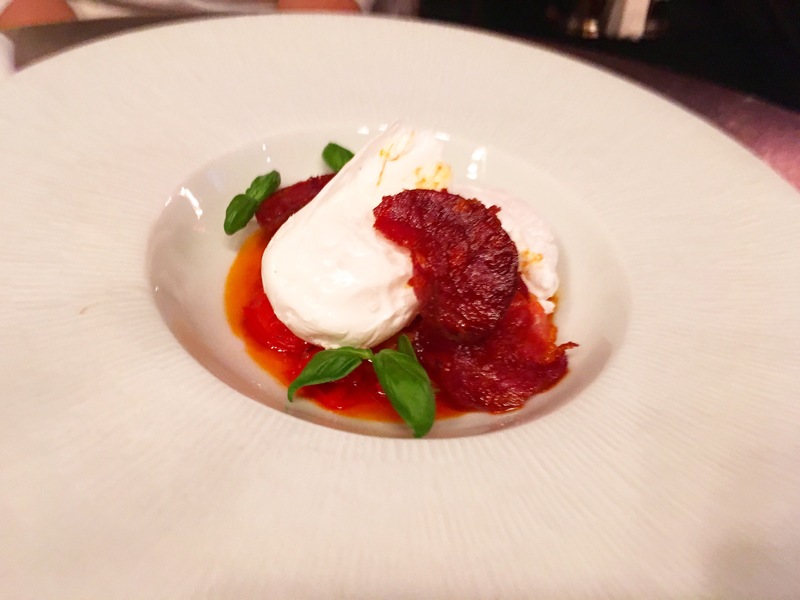 So that’s your first taster of my London Eating Adventure – check back soon for the next portion, and please leave any foodie recommendations below – there’s so many places to discover in London and I simply must eat at them all.